Sharon Day champions and protects water in a unique way. Her commitment goes beyond the typical activities of promoting legislation or simply speaking up for issues. She is a lifelong activist whose mission is cultural and spiritual and whose efforts can lead to transformational change. Sharon is a water walker who is carrying forward a new tradition to honor and protect our shared waters. CURE honored Sharon at the “Water, Women, and Democracy” event on Saturday, July 28 at Wegdahl County Park on the banks of the Minnesota River. The day was a celebration of Sharon and her accomplishments. Sharon was part of an Indigenous Women Leaders Round Table and she shared her thoughts during a conversation about creating a Water Ethic Charter for Minnesota. 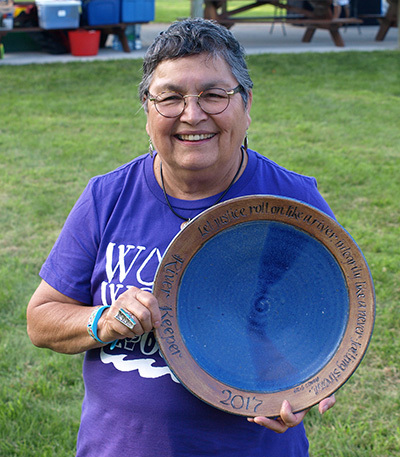 In the evening a group of water walkers and former RiverKeepers surrounded Sharon and presented her with the RiverKeeper Plate. The RiverKeeper Plate has a bible verse on it from the book of Amos: “May justice flow like water and integrity as an unfailing stream.” Justice and integrity are rare traits, and when CURE sees them lived out, we honor those individuals for the RiverKeeper award. It is also appropriate to ask of potential RiverKeeper recipients: “What have you done for the water?” In Sharon’s case that is an easy question to answer. 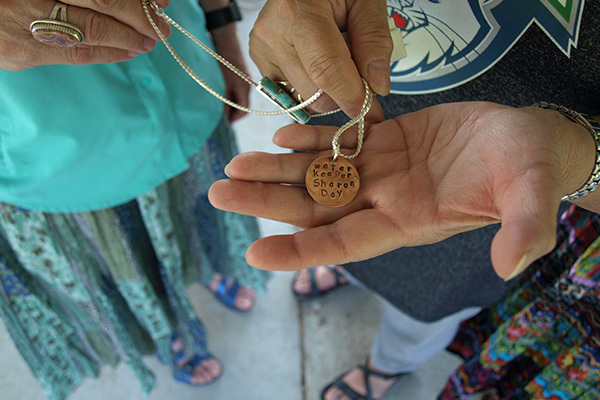 In late summer of 2017, Sharon led a group of core water walkers along the length of the Missouri River in a ceremony known as a “Nibi Walk.” Nibi is the Anishinaabe (Ojibwe) word for water. This 2,460-mile journey began on August 1 at the Missouri River Headwaters State Park near Three Forks, MT and ended on September 22 in St. Louis, MO. In traditional Anishinaabe (Ojibwe) communities, women were given the responsibility of taking care of the water. Water is a medicine that helps to keep all people alive. The Anishinaabe believe that water is the blood of Mother Earth. People depend on water for drinking, for medicines that grow in the water, for travel, and for …the food that we eat. Water is a sacred gift from the Creator. Water walking is a modern ceremony started in 2003 by Sharon’s mentor, Josephine Mandamin of the Wikwemikong First Nation. It involves women carrying a copper pail of water from the headwaters of a river to its end while praying for the water and praying with the water. By carrying water from the beginning of the river to the end, you presumably are starting with cleaner water, and at the end of the walk, you can show the water at the end what it once was like. Sharon has led or co-led fourteen water walks including the Chippewa River, Cuyahoga River, James River, Kettle River, Minnehaha Creek, Minnesota River, Mississippi River, Ohio River, Pokemaga Lake, Potomac River, St. Louis River, Seneca Lake, Mother Earth Water Walk (from the Gulf of Mexico to Lake Superior), and, the longest river in the United States, the Missouri River. On August 4, 2018, Sharon started leading the next Nibi Walk along the Wisconsin River. Sharon has been engaged politically for most of her life. She is currently the executive director of the Indigenous Peoples Task Force in Minneapolis, an organization whose mission is to improve the health and education of indigenous people. Their programs include Ikidowin Peer Education Program (youth theatre troupe), and Asemaa (Tobacco) Programs. Sharon is also an appointed member of the Minnesota Pollution Control Agency’s Clean Water Council. She is a grandmother and great-grandmother as well as an artist, musician, and writer. Every Sunday, she leads a Water Ceremony on the Mississippi River. She is second degree M’dewiwin (a degree of spiritual leader in the Anishinaabe tradition) and follows the spiritual path of the Anishinaabe people. Over the years Sharon has received numerous awards, including the Resourceful Woman Award, the Gisela Konopka Award, BIHA’s Women of Color Award, The National Native American AIDS Prevention Resource Center’s Red Ribbon Award, and most recently, the Alston Bannerman Sabbatical Award. She has been named as one of the 100 best-loved women by Yes! Magazine. The state of Minnesota and the cities of St. Paul and Minneapolis have recognized Day’s contributions, in part, by declaring November 10, 1998, in her honor. To learn more about Sharon and Nibi Walks watch this great video.